It is no secret that in its history, Clare, Michigan played host to nationally-known mobsters. In the late 1920s and early 1930s the booming Michigan oil patch proved a way for mob figures from Detroit and other locations to invest, and launder, their illicitly obtained money. 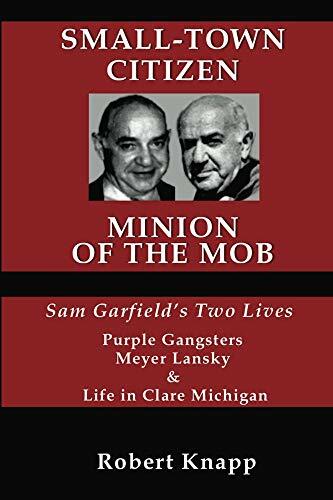 Robert Knapp’s book, Small-Town Citizen Minion of the Mob: Sam Garfield’s Two Lives (Clare, MI: Cleophile Press, 2018) tells the intriguing story of Sam Garfield, a man whose life and finances were intimately tied to organized crime, and a well-liked and respected citizen of Clare. Garfield was not a native. He was born in Russia and grew up in Detroit. In one of those curious twists of fate the grade school he attended turned out to not only graduate students skilled in readin’, writin’, and ‘rithmetic but a fair number of individuals who would go on to careers in organized crime. Sam knew them from the old days, and they knew Sam. In the 1920s Sam demonstrated a skill of much interest to his old friends; he was quite good at running “respectable” gambling clubs, “respectable” in that the clientele was well-off citizens engaging in illegal activities, both gambling and invariably the purchase and consumption of Prohibition banned alcohol. Illegal gambling brought only minimal risks to those who were involved. If arrested gamblers were usually given small fines and almost never received jail time. In fact the biggest problem the operators of gambling establishments faced from the law was property damage. The police, who occasionally raided gambling parlors, often made a show for the press of busting up the furniture and otherwise trashing the premises. The result was a rather expensive bill when the club re-opened, which it often did. Garfield would be involved in gambling all of his life, sometimes on one side of the law and sometimes on the other. He was, for example, heavily involved in the mob-related but completely legal gambling casinos that sprang up in Las Vegas after World War II, while at the same time having his hand in other, illegal, gambling operations. Sam developed a second talent even more valuable to his mob associates; money laundering. In 1929 Sam was invited up to a cabin in Harrison by Carl “Jack” Livingston, a very successful oil “land man” (the fellow who convinced land owners to sign over the mineral rights). The meeting was also attended by Isaiah Leebove, a lawyer tutored in money laundering by New York City gangster Arnold Rothstein. Rothstein had been gunned down in a gangland murder in November 1928, and his close associate, Leebove, had found it convenient to leave the Big Apple soon thereafter. The three men created the Mammoth Petroleum and Producing Company. Garfield learned the oil business from Livingston and how to launder money from Leebove. Sam Garfield turned out to be a pretty good in both areas. Mob money went into his oil investments dirty at the beginning and clean when he was finished. Better yet, mobsters who “trusted” him with their money often were paid a bonus dividend when a well in which Sam invested struck oil. Not only did Garfield make a good living in mid-Michigan, he also decided to make Clare his home. Knapp’s book details (insofar as one can detail these sorts of things) Garfield’s many, many sometimes legal and sometimes marginal or simply illegal activities. Knapp also details Garfield’s life in Clare, where he was a “regular guy” and a generous person both individually and within the community. The public library benefitted handsomely from his largesse. Many individuals told stories of Sam helping them out in hard times. Stories about Sam and bags full of cash were many in Clare. He often stopped by the local bank to deposit similar bags. Garfield’s generosity to members of the community who he did not do business with was also legendary. If friends where going to “Vegas” he encouraged them to stay at the MGM Grand, and drop his name. Those who did uniformly report that they were treated “like royalty.” If you wanted to see a sold out show, Sam’s name would be enough to receive complimentary, front-row seats. Often management threw in an added bonus, the hotel stay was also made complimentary. If Sam heard of someone in need at Christmastime, the need was taken care of. Same frequently ate at the Doherty Hotel. Knowing the local girls who waitressed over the summer were often working for college money, he often left them huge tips -- $100 in the 1950s. Garfield’s wife, Ruby, was one of the community’s leading citizens. She was gregarious, personally generous with her money and time, frequently taking young people under her wing who would subsequently refer to her as “Aunt Ruby”, and a leading light in community philanthropy. She gave generously to her church. Like Sam, she loved the library. She chaired the local United Fund drives in 1951 and 1952. It was hard to find anyone in Clare, even those who held Sam at arm’s length, who didn’t like Ruby. Of course, there was the occasional public embarrassment. In 1963, popular Life magazine published an expose of a particularly egregious case of securities swindling and subsequent jury-tampering. Garfield had been indicted in the affair, and eventually pled guilty to one charge. Sam’s picture was prominently featured in the magazine. Somehow that issue of Life disappeared from the Clare stores that usually sold the publication, perhaps more to spare Ruby’s feelings than Sam’s. This is but one example of how Clarites often reciprocated Sam and Ruby’s generosity with a few favors of their own. Another was a tendency to speak well in public of the couple’s civic and personal generosity. Residents also tended toward rather poor memories if the FBI came around asking questions about Sam’s whereabouts and associates. Knapp’s book is a wonderful read into one of those often quietly forgotten corners of life in rural Michigan. 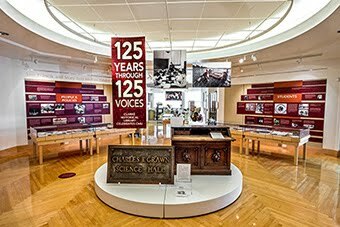 In the happy world of many local history books there isn’t much ink spilled on town figures with shady reputations. When it does occur, the mention is usually brief and often accomplished by reference to an amusing, if admittedly technically illegal, situation. Sam Garfield was a man of incredible contradictions. He was a generous local benefactor. He was an astute businessman engaged in many very successful legal activities and investments. He was a front man for the mob who frequently made money through activities on the wrong side of the law. Locally he was a personal friend and generous benefactor to many of Clare’s residents. Nationally he was a trusted business partner and friend of some of the mob’s leading figures. Buy the book. It’s a fun and informative read.